“Wurzelwerk und Winzers Beitrag” (Root Work and Winemaker’s Contribution) is a fascinating and much talked about project of 4 winemaker friends/relatives from 3 world class wineries in Germany and in Austria. 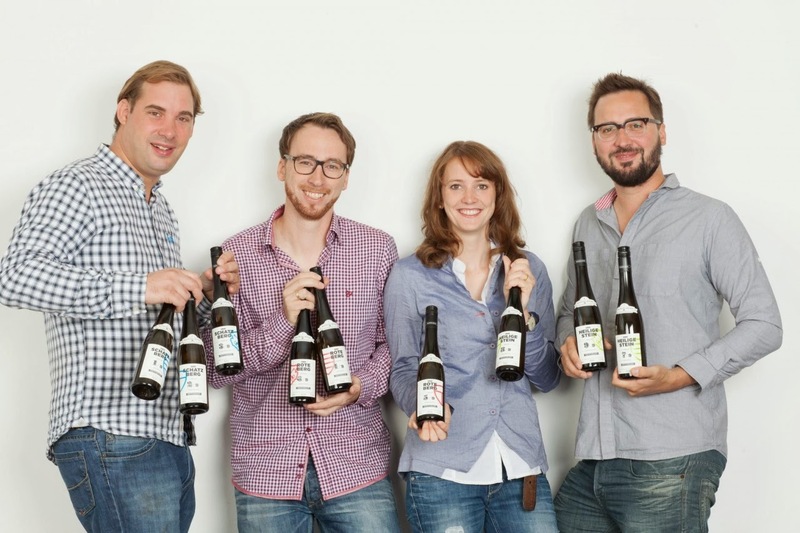 Max von Kunow (Weingut von Hövel, Saar, Germany), Johannes Hasselbach (Weingut Gunderloch, Rheinhessen, Germany) and Alwin + Stefanie Jurtschitsch (Weingut, Jurtschitsch, Kamptal, Austria) shared a portion of their 2012 Riesling grapes with the other 2 wineries and vinified the own portion as well as the 2 portions from the other 2 wineries into 3 separate wines. Thus, they made a total of 9 different wines. In March 2014, they (except for Stefanie Jurtschitsch – expecting a baby) came for about a week to the US. The main reason was the New York City presentation of their estates at the David Bowler Portfolio tasting. They used the trip to present their Wurzelwerk project to the American public. The March 18 tasting in Washington DC, organized by Rudi Wiest Selections and ombiasy PR and WineTours, was the central event in the US. David Bowler (US Importer of Weingut Jurtschitsch): Over the past generation, the Jurtschitsch winery in Langenlois, Kamptal, has grown into one of the most prominent top wineries in Austria. Having being run by the three brothers Edwin, Paul and Karl Jurtschitsch, the family-owned winery has now been passed on to the younger generation, to Alwin Jurtschitsch and his partner Stefanie Hasselbach. This family business succession has been prepared thoroughly. The couple travelled around the world, gathering experience in New Zealand and Australia. Working as interns in famed wineries in France, they got to know the French school of the Old Wine World. “It was a wonderful time and we learnt a lot. Now, we can put the ideas and the experience we have gained into practice back home in the Kamptal”, explains Alwin Jurtschitsch. A first step was the change-over to an organic cultivation of the family-owned vineyards. It was followed by a reduction of the wine-growing sites so that they could concentrate of the first-class appellations of the Kamp Tal. And all this went smoothly and with a great deal of sensitivity and respect for tradition. The wine philosophy also underwent a transformation: “Our wine style became more ‘polarising‘, characterised by the idea of terroirs without compromise”, says Stefanie Hasselbach. They produce wines which let the vineyards and soils speak for themselves, even about the winegrower who cares for them. “Yes, we are farmers”, Alwin Jurtschitsch stresses, “this is our work, our tradition and handcraft in the best sense of the word.” In the cellar, all this is turned into a work of art. The wines shine in multi-faceted elegance, offering drinking pleasure at highest level without being baroque and heavy. The Grüner Veltliner wines interpret the Kamp Valley’s spiciness at its finest, while the Rieslings impress with their crystalline minerality. The renowned Gault Millau wine guide most recently called the Jurtschitsch winery “the most exciting one in Langenlois at present”! David Bowler (US Importer of Weingut von Hoevel): Baron Eberhard “Adt” von Kunow is the owner and proprietor of the small but wonderful von Hovel estate. He made the wines there from 1973 to 2010; however, after a debilitating stroke (from which we are pleased to report he has largely recovered), his son Maximilian (the 7th generation) took charge of the winemaking. Max runs the estate along increasingly organic methods, and like many in his generation, also seeks to create great dry wines. But von Hovel remains a haven for the hauntingly delicate style of fruity Rieslings unique to the Saar river valley, the coolest growing area in Germany. These are crystalline, low alcohol wines from the “old school,” teeming with minerals and flowers in their youth, and often petrolly in their later years. They represent some of the finest values in the Rudi Wiest portfolio. Oberemmeler Hütte – (17.5 Acres) a monopole of the estate – very light soil, weathered slate, it produces some of the most delicate, subtle, yet steely Rieslings in Germany. Oberemmeler Rosenberg – the estate owns over 6 acres of the “filet” piece also known as the Rosenkamm, which has many old vine scattered throughout. For example, the 2011 Riesling Estate Spätlese “R” was selected from only those old vines with a yield of only 10hl/ha! Kanzemer Hörecker – (barely 1 acre) monopole – one of the smallest yet greatest vineyards in the Saar, grey green slate with a proportion clay and red soil. The estate also owns small portions of the heavy soiled Oberemmeler Karlsberg. The von Hövel estate produces 5,000 cs and is a founding member of the Mosel VDP. Adt von Kunow was for many years the auctioneer for the annual VDP auction in Trier. The upcoming Germany (North) tour by ombiasy will visit Max von Kunow and his winery. It all started in 1890, when the banker Carl Gunderloch purchased the Gunderloch manor house in Nackenheim. As the story goes, he used to trek from Gundersblum, his place of birth, to his bank in Mainz. On these journeys he carefully observed how the sun played off the hills along the Rhein Terrace. Based on these observations he purchased vineyard property that appeared to collect sunlight most efficiently and founded the Gunderloch Estate. Today, the Estate is still in the hands of the Gunderloch family. Vineyard practices include hand cultivation, hand harvesting and low yields with an average of 50 hl/ha for the estate as a whole. Once the fruit reaches the winery it is crushed gently without destemming, and then fed by gravity to the vats where it sees a slow, temperature-controlled fermentation to preserve the fruit character of the wines. The property and vineyards have remained in family ownership since the days of Carl Gunderloch, who died in 1935, the estate passing first to Gunderloch's granddaughter Elizabeth Usinger and her husband. They remained at the helm until 1965, when their son Carl Otto took on the management of the estate. Until recently, his eldest daughter, Agnes Hasselbach-Usinger and her husband, Fritz Hasselbach, were in charge. Today, Johannes Hasselbach is at the helm of Weingut Gunderloch. The upcoming Germany (South) tour by ombiasy will visit Johannes Hasselbach and his winery. The Jurtschitsch couple met and studied togather at the Geisenheim University in Germany. When Alwin and Stefanie got married, Max von Kunow, who had studied with them at the Geisenheim University, was their best man. Through Stefanie Jurtschitsch (nee Hasselbach), Johannes Hasselbach was introduced to Alwin Jurtschitsch and Max von Kunow. Before taking over their respective wineries, each traveled and interned at wineries from Australia and New Zealand to Canada. The idea is simple: Each of them harvests on the same day 1500 kg of grapes from a top vineyard. Each of them shares 500 kg of the grapes with the others and keeps 500 kg. Each of them vinifies the 3 batches separately in his/her cellar. The implementation was a bit more complicated: To start with, the 4 winemakers had to find 3 parcels where the grapes were expected to be ripe at about the same time and could be harvested the same day. The harvest date had to be shiften several times for several reasons. After harvest, the grapes were allowed to macerate for 13 hours. 2/3 of the grapes underwent maceration on a truck, while being transported to the other wineries. Upon arrival at the wineries, the grapes were pressed and fermented with ambient yeast in 330 liter stainless steel tanks. Each winery produced 3 times 300 half liter bottles. Total: 2700 bottles. The grapes come from 3 of the best Riesling vineyards in the world: (1) Scharzhofberg at Weingut von Hövel (gray slate); (2) Nackenheimer Rothenberg at Weingut Gunderloch (red shale); and (3) Zöbinger Heiligenstein at Weingut Jurtschitsch (sandstone). When I heard about the project for the first time, I thought that Max von Kunow had made his wines in a typical low alcohol, fruity-sweet style, Alwin and Steffi in a bone dry style and that Johannes perhaps could have experimented with fermentation in barrique. But this turned out not to be the case. By contrast, to the extent possible, they all did the same in the cellar. They all fermented in stainless-steel tanks, they all fermented the wines in a bone-dry style. The all used the same yeast – indigineus yeasts from the vineyard. The wines are what some people would call “natural” wines - minimal intervention wines. We tasted the wines in 3 different flights: First, the 3 Scharzhofberg (Saar) wines, then the 3 Nackenheimer Rothenberg (Rheinhessen) wines and finally the 3 Heiligenstein (Kamptal) wines. Within each flight, the Weingut von Hoevel wine was the first wine, the Weingut Gunderloch wine the second wine and the Weingut Jurtschitsch wine the last wine. As noted earlier, the difference in the wines was much less than I had expected due to the massive standardization of the fermentation process. At the same time, given that massive standardization, the differences in the wines were quite amazing. The first flight - the 3 Scharzhofberg wines - was the leanest, with a tight acidity structure. The 3 Rothenberg wines were broader and more powerful, fruitier. The third flight – the 3 Heiligenstein wines – was the most mineral flight. The second wine in each flight - the wines fermented in the Gunderloch wine cellar – all had a touch of sweetness and were the most opulent wines, while those fermented in the von Hoevel wine cellar – the first wine in each flight - came across as more filgran, bone dry and stealy. The wines fermented in the Jurtschitsch cellar – the last wine in each flight - were the most closed wines, with herbal, wet wood notes. Overall, the wines showed more a wine cellar touch than a vineyard touch. This may change over time. With the grapes being grown in one country and fermented in another one, all kinds of labeling issues came up. The wines had to be classified as European Table Wine. The famous vineyard names could not be utilized; instead, fantasy names appear on the label. Finally, the grape variety (Riesling) does not appear on the label. While all this indicates that you have a cheap wine in the bottle, the Wurzelwerk case with 9 0.5 liter bottles is not at all cheap. It sells for Euro 300 in Germany and Austria and was offered for $630 at the Washington DC tasting (by MacArthur Beverages). Thanks, Alwin, Johannes and Max, for a great evening. At the invitation of Beth C. Sheligo, President of the German Wine Society in the USA and President of the Philadelphia/South Jersey Chapter, Annette Schiller, Ombiasy PR and WineTours, gave a presentation and led a tasting at Café Aldo Lamberti, 2011 Marlton Pike West, Cherry Hill, New Jersey. Annette talked about “New Developments in German Wine”, including the emerging new wine regions in the eastern part of Germany, the German red wine boom, and the new German Wine Classification, which is being pushed by the VDP, the association of about 200 German elite winemakers. 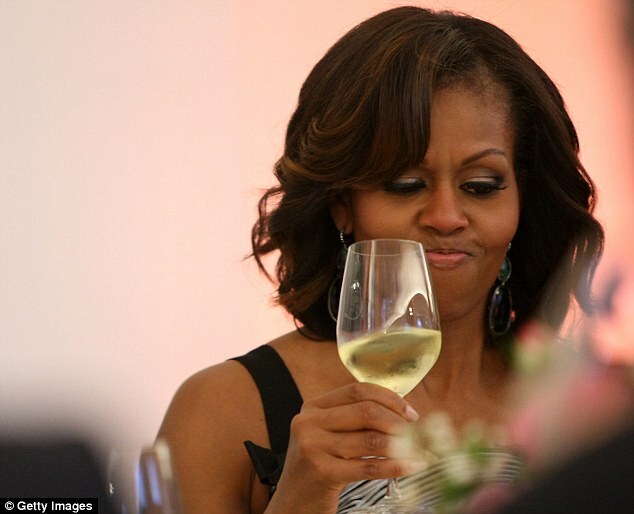 She also briefly talked about the 2 wine tours coming up to Germany that she is organizing and leading. We tasted 8 German wines from 8 different regions and had some good Italian food. 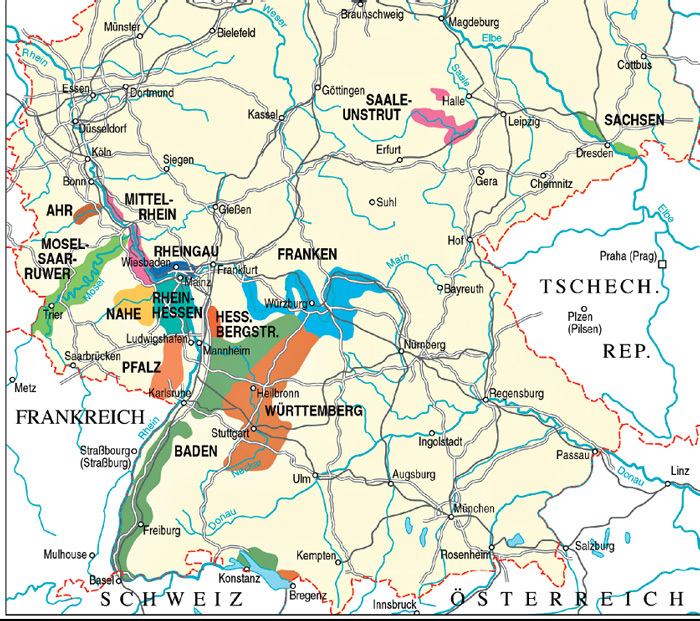 The Saale Unstrut wine region is Germany’s most northern wine region, in the valleys of the Saale and Unstrut rivers, around Freyburg and Naumburg. With 730 hectares of vineyard area, it is one of the smaller wine regions in Germany. The oldest record of viticulture dates back to the year 998 during the reign of Emperor Otto III. Located in the area of the former German Democratic Republic (GDR), Saale-Unstrut has become a thriving emerging wine region after the Berlin Wall came down in 1989 (as Sachsen, the other wine region in the area of the former GDR; Sachsen is half of the size of Saale Unstrut). The vineyards are located on the hillsides lining the Saale and Unstrut rivers. It all looks very attractive, with steep terraces, dry stone walls and century-old vineyard cottages, interspersed with meadows, floodplains. High above, are defiant castles and palaces. Saale Unstrut is located in a region that was the intellectual and cultural center of Germany (Heiliges Roemisches Reich Deutscher Nationen) for many centuries. The second German university (after Prague) was the University of Leipzig, which is just 50 km away from Saale Unstrut. Schiller and Goethe, to name just 2, lived here. Culture, history, nature and wine are combined here perfectly. Saale-Unstrut exports almost no wine and sells very little in the western part of Germany. Most of it is consumed in East Germany. The quality price ratio is not very favorable, so Saale Unstrut wines have a hard time to compete with the wines in West Germany. But the Saale Unstrut wine makers have no problems at all to sell their wine, as the Saale Unstrut wine is very popular with the locals and the tourists visiting East Germany, including the Baltic Sea. Of course, when you visit Weimar, Erfurth or Leipzig, to name a few of the many very historic towns of the eastern part of Germany, you want to drink local – either Saale Unstrut or Sachsen wines. White grape varieties make up 75% of Saale-Unstrut's plantations. The most common grape varieties are the white varieties Müller-Thurgau and Weißburgunder (Pinot Blanc). The wines tend to be vinified dry and have a refreshing acidity. The wines were selected by the German Wine Society (Philadelphia). Café Aldo Lamberti was packed that night. Of course, Annette contributed to it. The private room reserved for the German Wine Society was solidly filled. But the star of the evening was Pio Boffa from the famous Pio Cesare winery in Italia. A winemaker dinner with Pio took place at the same time as Annette’s event. Pio drew a crowd of 170 people, compared with 22 people listening to Annette. Annette and I recently attended a Pio Cesare winemaker dinner in Virginia, lead by Pio’s nephew Cesare Benvenuto and we had the pleasure to spend an evening with Pio Boffa in 2010 in Washington DC. We will visit a total of 17 wineries (12 are members of the VDP, the German association of elite wine makers; 1 is in Alsace) in 3 different wine regions where predominantly other grapes than Riesling are planted: Baden, the most southern German wine region and Germany’s answer to Burgundy; Pfalz with its almost Mediterranean climate and voluptuous whites and reds; Southern Rheinhessen where a variety of white grapes and also Pinot Noir grow. We will experience the German red wine revolution and discover the German Pinot Noir country. We will enjoy gourmet meals in the south of Germany very much influenced by the culinary traditions in neighboring France, just a hop across the Rhine River away. We will travel through quietly beautiful sun-kissed rolling hills planted with vines as far as the eye can see. Germany with its roughly 250,000 acres under vine belongs today to one of the smaller wine producing countries in the world. However, viticulture in Germany has a long tradition, going back to Roman times. In the 15th century, the area under vine was four times larger than it is today. Wars, subsequent loss of territory, diseases, overproduction, and competition from beer brewing resulted in land turned over to other agricultural uses. In the 19th century, concentration on terroir and technological progress fostered a tremendous improvement of quality and of the prestige of German wines. In 1987 German red wine accounted for only 15 percent of German wine output. Today, close to 40 percent of German wine is red. Soil conditions in the South were always conducive Pinot Noir and other red grape varieties, and with the climate changing more and more red varieties, in particular Pinot Noir, were planted. Today Germany makes stunning Pinot Noirs on par with the best of Burgundy. Our way of traveling really allows wine lovers to fully experience authentic Germany. Drawing on our love and deep knowledge of Germany and close personal ties to many personalities in the wine scene, our small group visits many of the hidden gems that other tours pass by, but which are essential to comprehend what German wine is all about.